Tucked along the coast on Waikiki’s west side, La Mer makes good use of its enviable location inside the Halekulani hotel — doors open up to welcome in the tradewind breezes and the sound of the ocean. The Neoclassic French restaurant is one of the best eateries on the oh-so picturesque island—and it’s the only Forbes Travel Guide Five-Star restaurant in Hawaii. It’s a testament to La Mer’s culinary team that the French-influenced, locally sourced dishes manage to upstage the ocean views. 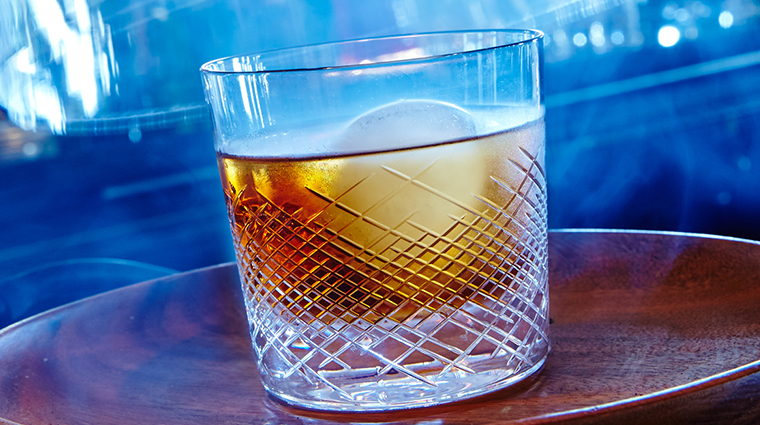 If you’re in the mood for cocktails before dinner, head to the hotel’s Lewers Lounge, where there’s an array of imaginative signature sips accompanied by live jazz. Or hit up L'Aperitif, La Mer’s sophisticated cocktail retreat with drinks created by The Ritz Paris' legendary head bartender, Colin Peter Field. The restaurant has stunning views. Plan to arrive before the sun goes down to witness the spectacular sunset. The blend of the haute cuisine and elegant décor with the open-air dining room and fresh ocean breezes — it’s truly a singular experience. This is a perfect setting for special occasions. The restaurant lends itself to celebrations with a private dining room, Salon La Mer, that faces the ocean and accommodates up to 16 guests. 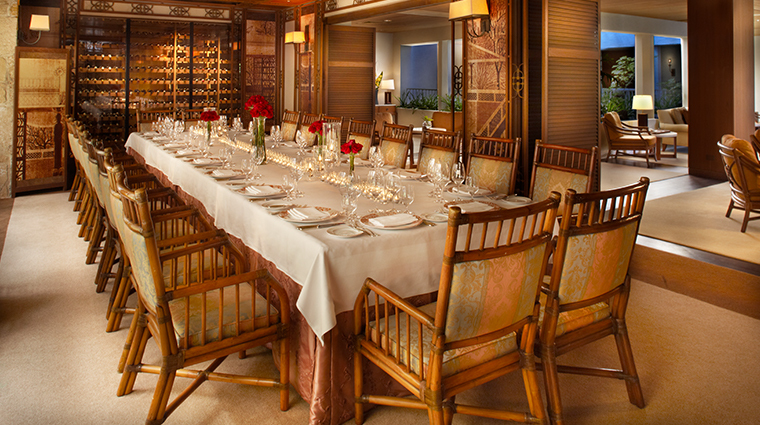 A second, larger private room called Salon du Vin fronts the restaurant’s exceptional wine collection and seats up to 24 guests. Halekulani, which means “house befitting heaven,” has sat on the Waikiki sugar-sand shore at 2199 Kalia Road for nearly a century. You’ll have to wait until dinner to eat at La Mer, the restaurant is only open in the evenings. La Mer has managed successfully to combine the relaxed Hawaiian atmosphere of Oahu with the formal French vibe of gourmet dining and you should dress accordingly. A long-sleeved collared shirt or a jacket for men is required. Ladies will want to dress to impress in something sophisticated as well. La Mer doesn’t have a cancellation policy. If you’re waffling on plans, go ahead and make a reservation even if you aren’t entirely sure that you can keep it. While the restaurant won’t charge you a fee for canceling on the fly, the splurge-worth eatery deserves a heads-up as soon as possible. For those looking to score a table at the last minute, continue to call throughout the day to see if a table has become unexpectedly available. You can also expect the Neoclassic French cuisine to live up to the graceful environs. One popular dish is the rouget (red fish) of Hawaii with fennel puree and crustacean Nantua sauce. For dessert, it’s hard to pass on La Mer’s Hawaiian vanilla soufflé with key lime, coconut and banana sauces topped with cocoa nibs. The space exudes elegance, from the gorgeous fresh floral displays at the entrance, to the tables arranged to make the most of the majestic panoramic ocean views. The view really is the thing. 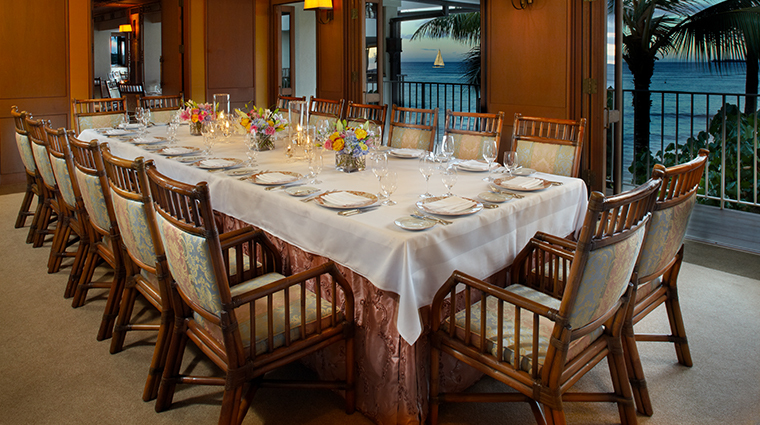 The restaurant boasts amazing views of the Waikiki Beach and deep blue Pacific Ocean below. 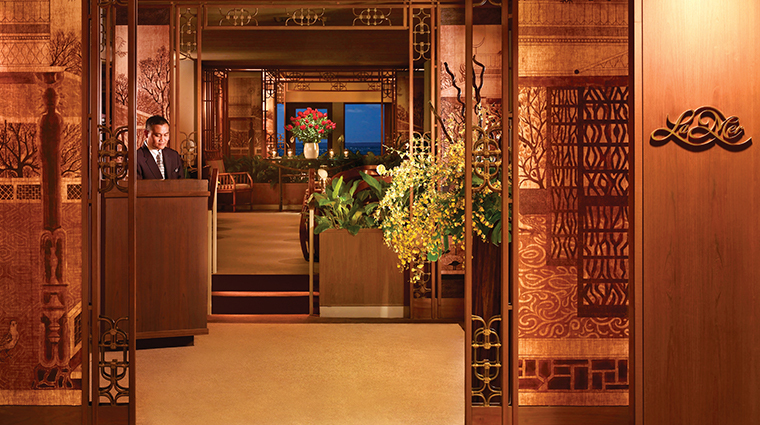 The open-air dining room feels utterly romantic and we suggest dressing to fit in with the grand but serene ambiance.